The Weekend Gourmet: Pecan-Crusted Lemon Pepper Tilapia with Pico de Gallo Cream Sauce...and a Magic Seasoning Blends Giveaway! Pecan-Crusted Lemon Pepper Tilapia with Pico de Gallo Cream Sauce...and a Magic Seasoning Blends Giveaway! As a food writer, I receive lots of great food products to sample and use for recipe development. For the recipe I'm sharing today, I used three different items that I recently received to make one fabulous seafood entree. My Pecan-Crusted Lemon Pepper Tilapia with Pico de Gallo Cream Sauce is bursting with the big-flavors we love, and it's ready to eat in just over 30 minutes. This recipe features Chef Paul Prudhomme's salt-free, sugar-free Lemon & Cracked Pepper seasoning, assertive Carbonell Spanish olive oil, and healthy delicious pecan meal from the National Pecan Shellers Association. After seasoning the mild tilapia fillets with the seasoning and coating them in the pecans, I gave them a quick sear in the olive oil. Then I topped each fillet with a quick sauce made from store-bought pico de gallo and half-and-half. The results were fantastic! 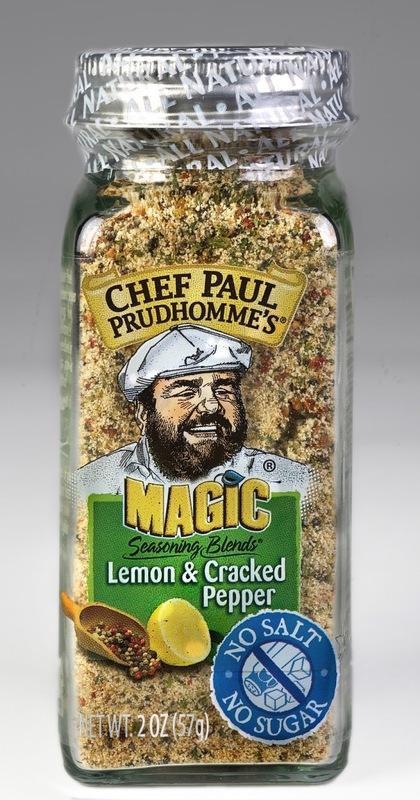 The Magic Seasoning is bold and assertive, with a zip from lemon peel and a perfect amount of spicy cracked pepper. It gave each bite of the mild tilapia the perfect spicy bite. The fact that this seasoning is salt-free and sugar-free means that it can be enjoyed by those who have health issues requiring them to limit sugar or salt...without sacrificing flavor in the process! We don't have health issues, but I like to adjust the level of salt in my dishes to suit our taste. This line of seasonings lets me do just that. There are five great seasoning blends in this healthy line, and all of them we tried were fantastic. Our personal favorite was this Lemon & Cracked Pepper blend; it goes great on fish or chicken. The Carbonell olive oil is the perfect partner for this seasoning, as it has an assertive flavor that stands up to the bold spices. The pecan meal provides an earthy flavor that plain breadcrumbs just can't provide. Add it up, and you've got a winner of a fish dish! Step 1: Season both sides of the tilapia fillets with the lemon pepper seasoning. 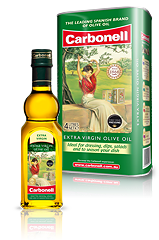 Heat the Carbonell olive oil in the a large non-stick skillet over med-high heat. While the pan heats, dip the seasoned tilapia in the beaten eggs and dredge in the pecan meal. Cook for 3-5 minutes per side, until cooked. The thicker your fillets, the longer they will take to cook through. Step 2: Make the sauce by adding the pico de gallo and half-and-half to a small non-stick skillet over med-high heat. Stir to combine and bring to a boil. Reduce heat and heat until reduced and thickened. Step 3: To serve, place the tilapia on top of rice or cheese grits. Spoon some of the pico de gallo cream sauce over the top of each fillet. This fish dish is bursting with spicy goodness, from the sauce and the seasoning on the fish. We loved this dish and how it made the mild tilapia to flavorful. 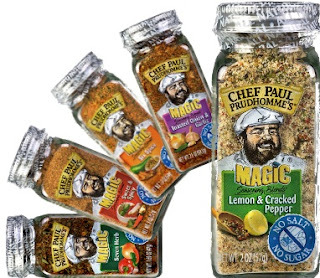 To help you create this lip-smaking fish dish in your kitchen, Chef Paul Magic Seasonings is going to give one of my readers a five-bottle assortment of their sugar-free, salt-free seasoning blends! To enter, follow the Rafflecopter instructions below...good luck! Disclosure: I received Magic Seasoning Blends, Carbonell olive oil and pecan meal from the National Pecan Shellers Association to facilitate this post. I received no other compensation, and the opinions expressed are my own.